Mini 4.5g square chocolate bars in MILK or MINT. SIZE OF CHOCOLATE BAR: 3.5cm squared. Personalisation can be added to both the front and back of this wrapper design. Please type in the freetext boxes below the personalisation you would like on each side. If you don't want anything on either side please type n/a in the relevant box. 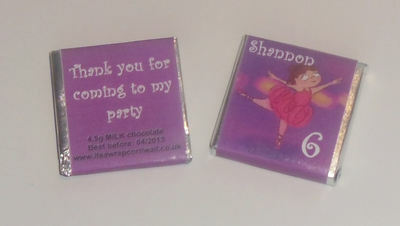 Other personalised products with this "little ballerina on stage" design also available. This artwork was designed by Loryn Brantz. We have been given permission to use this design by Magic Fairy Wings.